The Material and Its Divisions. The "613" Precepts. Liturgical poems treating of the precepts of the Law. The Babylonian Talmud (Mak. 23b) contains an utterance by R. Simlai to the effect that "613 commandments were revealed to Moses: 365, equal to the number of days in the year, were negative precepts; and 248, corresponding to the number of the component parts of the human body, were affirmative." R. Hamnuna finds a suggestive hint for this number in the alphabetical value of the Hebrew letters composing the word ("law"; Deut. xxxiii. 4), which amount to 611, to which there are to be added the first two passages of the Decalogue which were spoken not by Moses, but by God Himself to Israel. Although this enumeration repeatedly recurs in Talmud and Midrash, even in the name of the earlier teachers (compare Bacher, "Ag. Pal. Amor."i. 558, note 2), and later sages discovered new intimations of the number in various passages (see Rashi on Num. xv. 39; sources in Buber, "Midrash Agada," p. 113, note 24; further material in Steinschneider, "Hebr. Uebers." p. 926, note 152), it has not always remained undisputed; Baḥya, for instance (Ḥobot ha-Lebabot," Introduction), basing upon Ps. cxix. 96, eliminates the "duties of the heart" from these. Naḥmanides ("Sefer ha-Miẓwot," beginning) raises the question whether this number has traditional authority or whether it is merely an individual opinion of Simlai. From Abraham ibn Ezra, who points out ("Yesod Moreh," gate 2) that if all basic precepts and their derivatives, and those intended for all time, are considered, this number would be untenable, down to Simon b. Ẓemah Duran ("Zohar ha-Rakia'," end), who opines that Simlai counted the precepts after his own fashion and not in a manner authoritative for others, and that the number 613 is retained only as being incidentally correct, similar objections have repeatedly been made against the enumeration. Many teachers, nevertheless, accepting the figure, have busied themselves with the detailed enumeration. The compiler of the "Halakot Gedolot" was the first to attempt this in the introduction to his book. He divides his whole material into two main divisions, the first containing the prohibitive (negative) precepts, 71 of which are punishable with death, and 277 with scourging, total 348; the second containing the mandatory (affirmative) precepts, 200 in number, to which are to be added 65 laws and statutes incumbent upon the Jews as a whole, thus making 613 in all ("Hal. Gedolot," ed. Berlin, pp. 8 et seq. ; compare Hildesheimer, "Die Vaticanische Handschrift der Hal. Gedolot" pp. 13 et seq.). There is said to be a work in Arabic by Ḥefeẓ b. Yaẓliaḥ, upon the same subject, but nothing further is known of it. Maimonides does not agree with the author of the "Hal. Gedolot"; in section 14 of his "Sefer ha-Miẓwot" (Arabic original published by M. Bloch under the title "Le Livre des Préceptes par Moïse ben Maimon," Paris, 1888; for Hebrew translations, see Steinschneider, l.c. § 554, 2) he lays down certain principles which must be the guide in the enumeration of the precepts, and then counts up 248 affirmative and 365 negative commands, amounting to 613. This division agrees only in its total with that of R. Simlai in the Talmud, and in later times has been made use of particularly by the cabalists. It seems, however, to have remained unknown to the author of the "Hal. Gedolot," and is omitted in the parallel passage in Tanḥuma. Maimonides, indeed, who found it necessary to revise his own work, is not always consistent on this point; and his son Abraham was called upon to defend his celebrated father against the attack of R. Daniel ha-Babli ("Ma'ase Nissim," ed. B. Goldberg, Paris, 1866). Maimonides also found a redoubtable opponent in Naḥmanides, who was, however, concerned not so much to attack Maimonides as to defend the author of the "Hal. Gedolot," whose words were accounted "holy tradition" ("Sefer ha-Miẓwot," first printed at Constantinople, 1510). But Maimonides was not destitute of champions. Many sided with him, of whom Simon Duran ("Zohar ha-Rakia'") and Isaac de Leon ibn Ẓur ("Megillat Esther") may be mentioned: the former writes in a conciliatory vein; the latter can not bring himself to admit that any opinion of Maimonides could be wrong. It will suffice for present purposes merely to mention the "Sefer ha-Ḥinnuk," which follows a method of its own in enumerating the precepts. For the understanding of what follows, it must also be stated that, in addition to the 613 Biblical precepts, sometimes seven non-Biblical ones are added, making the total 620, which represents the numerical value of the letters in the Hebrew word ("crown"). It is this enumeration of the precepts of the Torah which furnishes the theme of all the poems known as "Azharot," a name derived from the first composition of this nature, which begins with the words ("Of old Thou didst give exhortations to Thy people"). The Azharot are variously described, both in printed works and in manuscripts, as "Exhortations of the Rabbis," "Exhortations Formulated in the Academy," "Exhortations of the Holy Academies of the Rabbis in Pumbedita," also "Exhortations of Elijah of Blessed Memory!" They are of great antiquity, and the probability must be conceded that they emanated from the academy of Joseph b. Abba Gaon of Pumbedita, concerning whom Sherira's "Letter" narrates that his academy was at times visited by Elijah the Prophet. Being of prior origin to the "Halakot Gedolot" (the last line, , is found reproduced in the "Hal. Gedolot," ed. Hildesh. 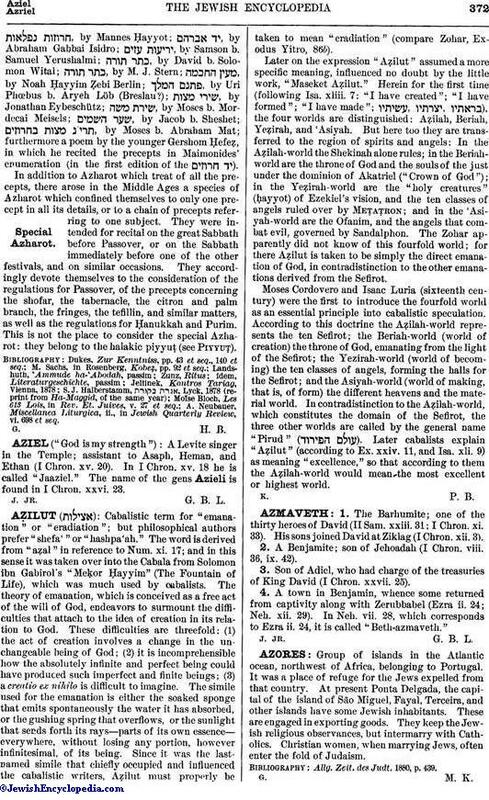 p. 9, and all ancient Azharot contain it), these older compositions do not enumerate the individual 613 precepts, and speak only in general terms of the 365 negative and 248 affirmative precepts, of their sources, contents, and of the manner in which they are derived from the actual words of the Scripture text, etc. Such specific enumeration was only possible after that of the "Hal. Gedolot," and this is found in the Azharot commencing ("Thou didst grant a law unto Thy people"). This composition, which follows the "Hal. 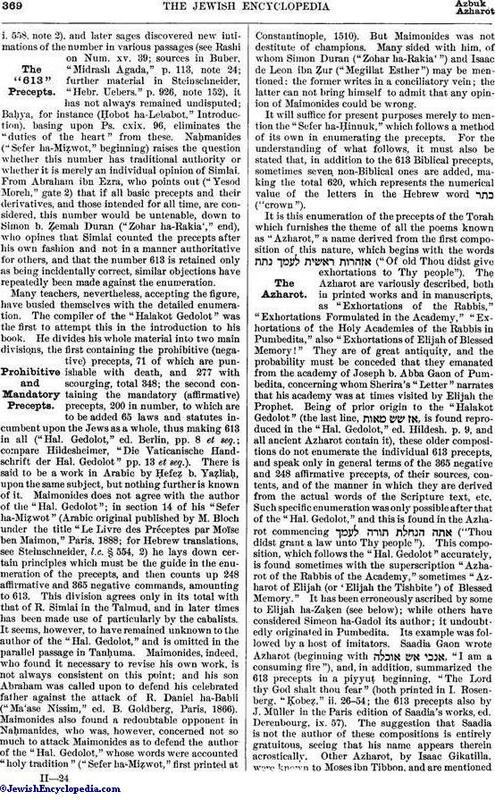 Gedolot" accurately, is found sometimes with the superscription "Azharot of the Rabbis of the Academy," sometimes "Azharot of Elijah (or 'Elijah the Tishbite') of Blessed Memory." It has been erroneously ascribed by some to Elijah ha-Zaḳen (see below); while others have considered Simeon ha-Gadol its author; it undoubtedly originated in Pumbedita. Its example was followed by a host of imitators. Saadia Gaon wrote Azharot (beginning with , "I am a consuming fire"), and, in addition, summarized the 613 precepts in a piyyuṭ beginning, "The Lord thy God shalt thou fear" (both printed in I. Rosenberg, "Ḳobeẓ," ii. 26-54; the 613 precepts also by J. Müller in the Paris edition of Saadia's works, ed. Derenbourg, ix. 57). The suggestion that Saadia is not the author of these compositions is entirely gratuitous, seeing that his name appears therein acrostically. Other Azharot, by Isaac Gikatilla, were known to Moses ibn Tibbon, and are mentionedby Isaac Petit b. Mordecai Kimḥi, but have not been preserved. Perhaps they are identical with the Azharot commencing ("I will gird me with strength to extol the Creator"), which, according to Isaac b. Todros, were contained in the "siddur" of Amram Gaon; even the present recension of this siddur contains pieces which are later than Amram's time. Solomon ibn Gabirol was the next to treat of the precepts in the Azharot commencing ("Thy God is a consuming fire"), edited by Sachs-Halberstamm, "Ḳobeẓ 'al-Yad," 1893; later on he wrote complete Azharot to which reference will be had in the following. Isaac b. Reuben Albargeloni is the author of the Azharot ("Where is the abode of understanding?"). 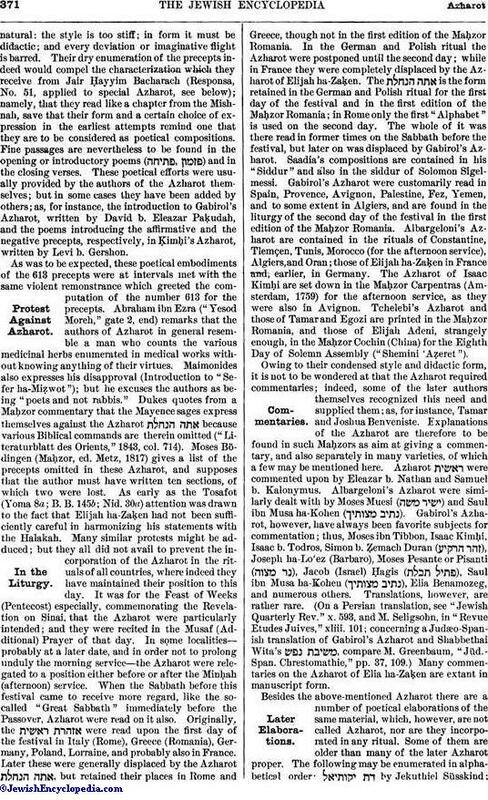 Elijah ha-Zaḳen b. Menahem of Mans wrote the Azharot ("Truth shall my mouth indite"), first published by Luzzatto in "Literaturblatt des Orients," 1850, part 16, and later reprinted by Rosenberg, l.c. pp. 55 et seq. Mention may be made here of the piyyuṭ by Eliezer b. Nathan, , intended for the evening service of the second day of Pentecost, which also treats of the 613 precepts. The Azharot commencing ("I, Understanding, dwell on high") were written by Isaac Petit b. Mordecai Kimḥi. Krespia ha-Naḳdan wrote Azharot beginning with the words ("I will extol Thee, O Lord, my King"). A species of Azharot was composed by Joseph b. Solomon Yaḥya, but nothing definite is known concerning it save that it was lost in a conflagration. Elijah ha-Kohen Tchelebi ( ) wrote ("I will bless the God Tremendous"). The Azharot "Pour forth Thy mercy" were written by Menahem Tamar. Menahem Egozi (Nut-Tree) entitles his Azharot, which begin , with a play upon his own name ("A blossom from the nut-garden"). Similarly, those of Elijah Adeni (of Aden), which begin with the words (Amsterdam ed., 1688), were entitled by him . Finally, mention must be made of the Azharot of Joshua Benveniste, which are only known from Azulai's "Shem ha-Gedolim" (s.v. ). R. Simlai's utterance, quoted above, speaks of the division of the Pentateuchal precepts into affirmative and negative commandments ( and ). The "Hal. Gedolot" observe this division; and, in addition, they group the individual precepts as far as may be according to their subject-matter. The Azharot do not observe this method: affirmative and negative precepts follow each other in wild confusion regardless of subject, entailing a great sacrifice of perspicuity. Saadia, in his "613 precepts," places, in two divisions, first 97 duties of the person ( ), and then 58 and 45 affirmative precepts referring to sacrifices, priests, and purification; in all, 200 affirmative commands. Then follow, in four divisions, 277 negative precepts (the specific enumeration is not correctly given in the present printed texts, nor even by Zunz): 71 punishable with death, and 65 sections pertaining to the community as a whole, amounting in all to 630. This clearly shows how closely Saadia adheres to the "Hal. Gedolot"; just so closely, too, does Isaac Albargeloni follow the same authority; and, indeed, this is the rule, as Maimonides remarks, with all Azharot composed down to the latter's time. Gabirol deviates from this practise only to the extent that he observes the Talmudic enumeration of 248 affirmative and 365 negative commands. Krespia ha-Naḳdan follows Maimonides in the enumeration, as do also Menahem Tamar and Joshua Benveniste. In his Azharot proper, Saadia disregards the strict demarcation between affirmative and negative precepts. He adduces the precepts according to their derivation from the Decalogue, an idea often imitated; by Saadia himself again in his Yeẓirah Commentary, and then, not only by later poets, but by writers on jurisprudence. 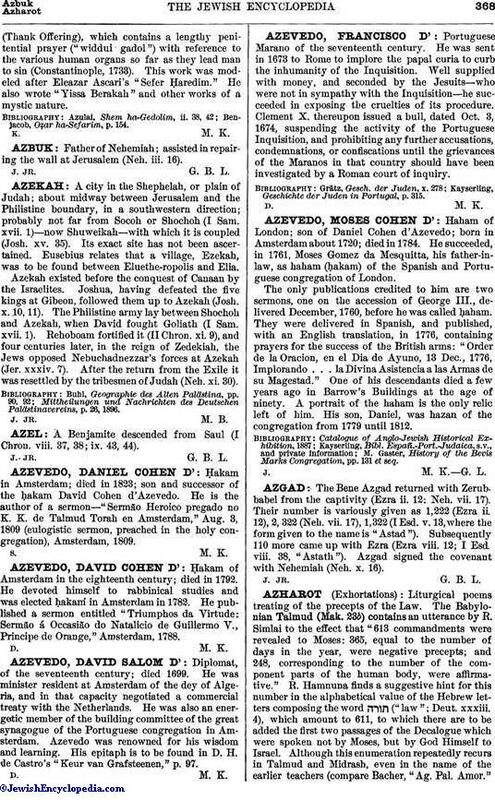 Of examples may be adduced here the "Ma'amar ha-Sekel" by an unknown author, and the cabalist Ezra-Azriel in his commentary upon the Song of Solomon. The attempt to establish such a derivation was rendered all the more alluring by the discovery of the fact that the individual letters contained in the Decalogue number 620, thus corresponding to the 613 precepts and the seven additional ones mentioned above. For further references, see Zunz, "Literaturgeschichte," p. 95, and Steinschneider, "Hebr. Bibl." vi. 125. As regards the poetical form of the Azharot there is little to be said. The oldest pieces and are extremely simple in composition; the verses, which contain the alphabet in acrostic fashion, are two-membered and bare of all poetic adornment, such as rime, meter, etc. Rime appears later, and a division into strophes becomes general; the alphabet, both in its usual order and inverted ( ), being given acrostically, as is also the name of the writer. Saadia's composition is more artificial, in that he not only uses the opening words of each article of the Decalogue, but interweaves therewith phrases from the Song of Solomon and from the eight verses of Psalm lxviii., which are associated by the Talmudists with the Pentecost festival. The construction of these compositions is fully treated by Zunz, Sachs, and Landshuth. Saadia's "613 precepts" are less artificial in construction, but possess rime, strophes, and refrain. Gabirol uses four-membered strophes, the first three of which have changing rimes of their own; the fourth, a rime running through the poem. Tchelebi's Azharot are also metric, although halting in many places; Tamar, whose Azharot are metrical and resemble Gabirol's in construction, endeavors to find excuse for the halting measure of his predecessors (Steinschneider, "Cat. Leyden," p. 396). Isaac b. Reuben closes his strophes most cleverly with a verse from the Bible, greatly to the admiration of Al-Ḥarizi, who was himself an adept in the ingenious application of Biblical passages. The same is true of the Azharot of Elijah ha-Zaḳen, whose Azharot consist of 176 four-membered strophes with alphabets (backward as well as forward) and frequent interweaving of names as acrostics. That such poems can not possess poetic value isnatural: the style is too stiff; in form it must be didactic; and every deviation or imaginative flight is barred. Their dry enumeration of the precepts indeed would compel the characterization which they receive from Jair Ḥayyim Bacharach (Responsa, No. 51, applied to special Azharot, see below); namely, that they read like a chapter from the Mishnah, save that their form and a certain choice of expression in the earliest attempts remind one that they are to be considered as poetical compositions. Fine passages are nevertheless to be found in the opening or introductory poems ( ) and in the closing verses. These poetical efforts were usually provided by the authors of the Azharot themselves; but in some cases they have been added by others; as, for instance, the introduction to Gabirol's Azharot, written by David b. Eleazar Paḳudah, and the poems introducing the affirmative and the negative precepts, respectively, in Ḳimḥi's Azharot, written by Levi b. Gershon. As was to be expected, these poetical embodiments of the 613 precepts were at intervals met with the same violent remonstrance which greeted the computation of the number 613 for the precepts. Abraham ibn Ezra ("Yesod Moreh," gate 2, end) remarks that the authors of Azharot in general resemble a man who counts the various medicinal herbs enumerated in medical works without knowing anything of their virtues. Maimonides also expresses his disapproval (Introduction to "Sefer ha-Miẓwot"); but he excuses the authors as being "poets and not rabbis." Dukes quotes from a Maḥzor commentary that the Mayence sages express themselves against the Azharot because various Biblical commands are therein omitted ("Literaturblatt des Orients," 1843, col. 714). Moses Bödingen (Maḥzor, ed. Metz, 1817) gives a list of the precepts omitted in these Azharot, and supposes that the author must have written ten sections, of which two were lost. As early as the Tosafot (Yoma 8a; B. B. 145b; Nid. 30a) attention was drawn to the fact that Elijah ha-Zaḳen had not been sufficiently careful in harmonizing his statements with the Halakah. Many similar protests might be adduced; but they all did not avail to prevent the incorporation of the Azharot in the rituals of all countries, where indeed they have maintained their position to this day. It was for the Feast of Weeks (Pentecost) especially, commemorating the Revelation on Sinai, that the Azharot were particularly intended; and they were recited in the Musaf (Additional) Prayer of that day. In some localities—probably at a later date, and in order not to prolong unduly the morning service—the Azharot were relegated to a position either before or after the Minḥah (afternoon) service. When the Sabbath before this festival came to receive more regard, like the so-called "Great Sabbath" immediately before the Passover, Azharot were read on it also. Originally, the were read upon the first day of the festival in Italy (Rome), Greece (Romania), Germany, Poland, Lorraine, and probably also in France. Later these were generally displaced by the Azharot , but retained their places in Rome and Greece, though not in the first edition of the Maḥzor Romania. In the German and Polish ritual the Azharot were postponed until the second day; while in France they were completely displaced by the Azharot of Elijah ha-Zaḳen. The is the form retained in the German and Polish ritual for the first day of the festival and in the first edition of the Maḥzor Romania; in Rome only the first "Alphabet" is used on the second day. The whole of it was there read in former times on the Sabbath before the festival, but later on was displaced by Gabirol's Azharot. Saadia's compositions are contained in his "Siddur" and also in the siddur of Solomon Sigelmessi. Gabirol's Azharot were customarily read in Spain, Provence, Avignon, Palestine, Fez, Yemen, and to some extent in Algiers, and are found in the liturgy of the second day of the festival in the first edition of the Maḥzor Romania. Albargeloni's Azharot are contained in the rituals of Constantine, Tlemcen, Tunis, Morocco (for the afternoon service), Algiers, and Oran; those of Elijah ha-Zaḳen in France and, earlier, in Germany. The Azharot of Isaac Kimḥi are set down in the Maḥzor Carpentras (Amsterdam, 1759) for the afternoon service, as they were also in Avignon. Tchelebi's Azharot and those of Tamar and Egozi are printed in the Maḥzor Romania, and those of Elijah Adeni, strangely enough, in the Maḥzor Cochin (China) for the Eighth Day of Solemn Assembly ("Shemini 'Aẓeret"). Owing to their condensed style and didactic form, it is not to be wondered at that the Azharot required commentaries; indeed, some of the later authors themselves recognized this need and supplied them; as, for instance, Tamar and Joshua Benveniste. Explanations of the Azharot are therefore to be found in such Maḥzors as aim at giving a commentary, and also separately in many varieties, of which a few may be mentioned here. 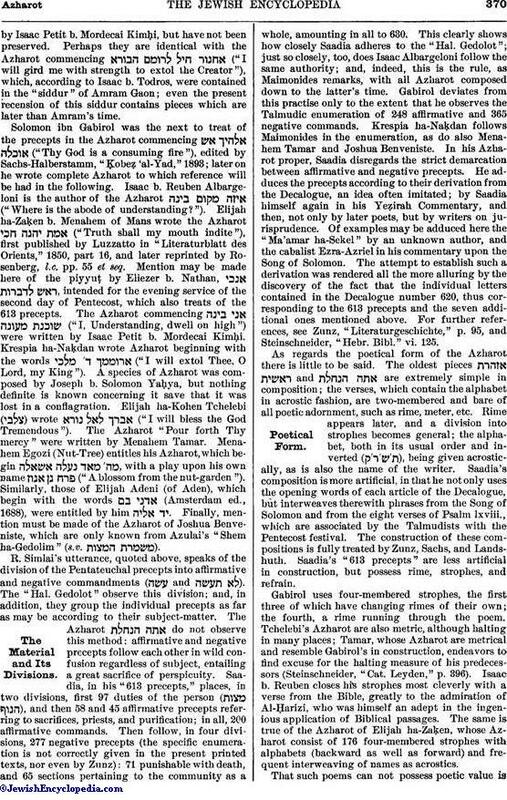 Azharot were commented upon by Eleazar b. Nathan and Samuel b. Kalonymus. Albargeloni's Azharot were similarly dealt with by Moses Muesi ( ) and Saul ibn Musa ha-Kohen ( ). Gabirol's Azharot, however, have always been favorite subjects for commentation; thus, Moses ibn Tibbon, Isaac Kimḥi, Isaac b. Todros, Simon b. Ẓemach Duran ( ), Joseph ha-Lo'ez (Barbaro), Moses Pesante or Pisanti ( ), Jacob (Israel) Ḥagis ( ), Saul ibn Musa ha-Kohen ( ), Elia Benamozeg, and numerous others. Translations, however, are rather rare. (On a Persian translation, see "Jewish Quarterly Rev." x. 593, and M. Seligsohn, in "Revue Etudes Juives," xliii. 101; concerning a Judæo-Spanish translation of Gabirol's Azharot and Shabbethai Wita's , compare M. Greenbaum, "Jüd.Span. Chrestomathie," pp. 37, 109.) Many commentaries on the Azharot of Elia ha-Zaḳen are extant in manuscript form. Besides the above-mentioned Azharot there are a number of poetical elaborations of the same material, which, however, are not called Azharot, nor are they incorporated in any ritual. Some of them are older than many of the later Azharot proper. The following may be enumerated in alphabetical order: by Jekuthiel Süsskind; , by Mannes Ḥayyot; , by Abraham Gabbai Isidro; , by Samson b. Samuel Yerushalmi; , by David b. Solomon Wital; , by M. J. Stern; , by Noah Ḥayyim Ẓebi Berlin; , by Uri Phœbus b. Aryeh Löb (Breslau? ); , by Jonathan Eybeschütz; , by Moses b. Mordecai Meisels; , by Jacob b. Sheshet; , by Moses b. Abraham Mat; furthermore a poem by the younger Gershom Ḥefeẓ, in which he recited the precepts in Maimonides' enumeration (in the first edition of the ). In addition to Azharot which treat of all the precepts, there arose in the Middle Ages a species of Azharot which confined themselves to only one precept in all its details, or to a chain of precepts referring to one subject. They were intended for recital on the great Sabbath before Passover, or on the Sabbath immediately before one of the other festivals, and on similar occasions. They accordingly devote themselves to the consideration of the regulations for Passover, of the precepts concerning the shofar, the tabernacle, the citron and palm branch, the fringes, the tefillin, and similar matters, as well as the regulations for Ḥanukkah and Purim. This is not the place to consider the special Azharot: they belong to the halakic piyyuṭ (See Piyyuṭ). A. Neubauer, Miscellanea Liturgica, ii., in Jewish Quarterly Review, vi. 698 et seq.